Those who say fish can’t fly probably say they can’t hunt, either. We know better. 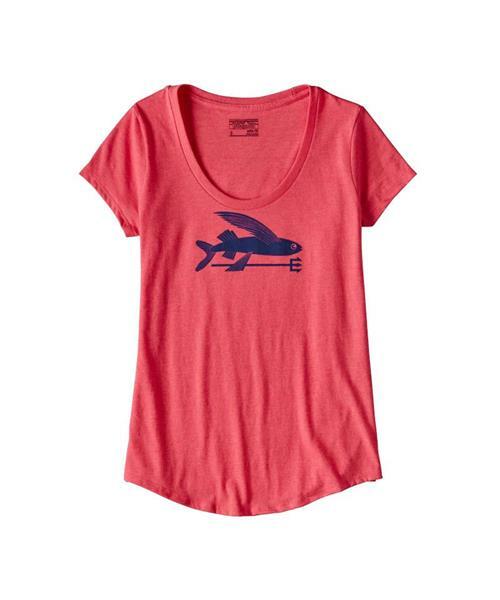 The Flying Fish Cotton/Poly Scoop T-Shirt is made from an exceptionally soft, 50/50 blend of postconsumer recycled polyester and ringspun, long-staple, U.S.-grown organic cotton. Features include a slim-fitting, feminine silhouette; shorter, capped sleeves; scoop neckline; and dropped hem. Original artwork by Geoff McFetridge is screen-printed using inks that are PVC- and phthalate-free. Taped shoulder seams for comfort and fit retention. Sturdy side seams keep garment from twisting and shrinking when washed.